POLR3D antibody LS-C289046 is an unconjugated rabbit polyclonal antibody to human POLR3D. Validated for IF, IHC, IP and WB. Region between residue 175 and 225 of human DNA-directed RNA polymerase III subunit D using the numbering given in entry NP_001713.2 (GeneID 661). 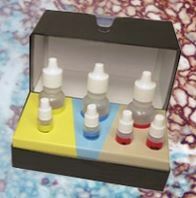 Immunohistochemistry: Antigen retrieval with citrate buffer pH 6.0 is recommended for FFPE tissue sections. Human controls: Breast Carcinoma, Prostate Carcinoma. 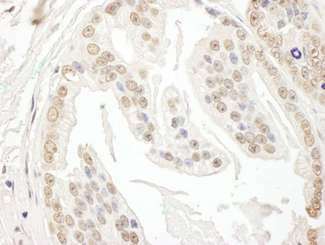 Detection of Human POLR3D by Immunohistochemistry. Sample: FFPE section of human prostate carcinoma. Antibody: Affinity purified rabbit anti-POLR3D used at a dilution of 1:1000 (0.2 ug/ml). Detection: DAB.